Lotus is a modern Sass Template Based on Latest Bootstrap 4.x Framework, Developer Friendly Sass and with a clean layout and elegant touch. Also, Lotus has a Unique and Creative Design, That’s made an Eye-catching and Different Perspective view for your website. We give our focus on User Experience Design and try to build user engagement with your Business by using Lotus. Lotus is Specially made for Sass, Startup, Web Agency, Creative Agency, Software Agency, Products Development Companies Niche and Also, suite for Software and Products related service. 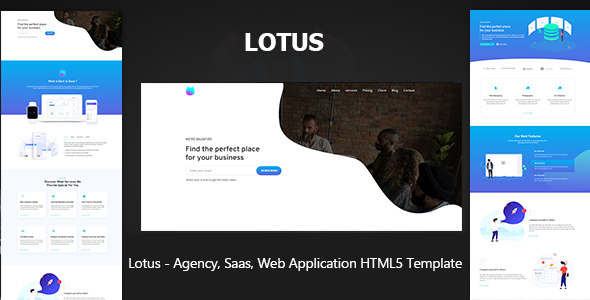 Lotus Sass Landing Template come up with About page, Service pages, Pricing page, FAQs page, Team page, Under Construction page, Error page, Blog Page, and Blog Details in Different Style. An additional page may help you to focus on Presenting your Products Management Details Information, Products Subscription, Etc. This Template is built with world most Popular CSS Framework Bootstrap 4.x, html5, css3, SASS, jQuery, and many Modern Technology Features. If you have any further questions, please don’t hesitate to contact our support team, we are always ready to give your answer, let us know your opinion for the better update. If you love our Template, don’t forget to rate 5 Star Please..